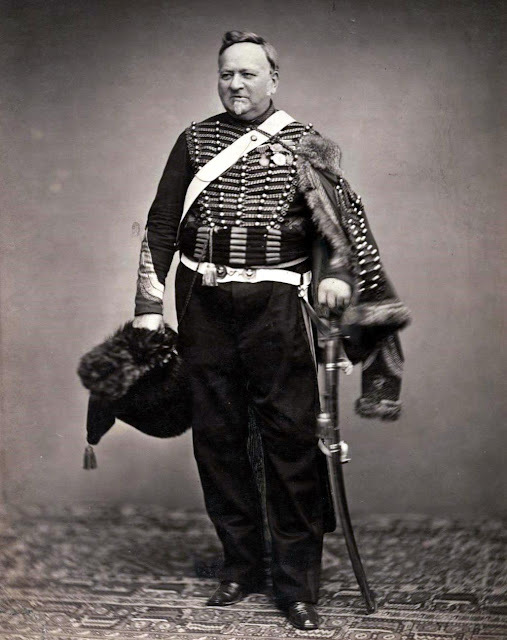 Quartermaster Sergeant François Delignon in the uniform of a Mounted Chasseur of the Guard of 1809-1815 in May 1858. "Funny" picture, Rob. Obviously this photo has not been taken during the 1809-1815 period. Also if you look at the dark grey shadow between the legs, which is different from the rest of the wall, this looks like a photo-shopped image. Or am I wrong? These photos have been taken in in May 1858 during a reunion of veterans of the Grande Armée (I've just added the date to the caption to avoid further confusion). I don't think they are photo-shopped, although I admit the dark grey shading between his legs is strange, but it is probably part of his uniform (it is also visible between his left leg and his sable). You can see more photos by clicking on the 'Waterloo Veteran of the Month' label.